With the use of Greeting Cards Designer Software, design variety of different greeting cards such as New Year Cards, Christmas cards, invitation cards, friendship cards and another types of greeting cards as you find in the shop. Design and create Greeting Cards using image designing tools including Line, Ellipse, Pencil, Rectangle, Text, Picture, Arc, Triangle and Star objects. Design and create Greeting Card and ecards in variety of shapes including Rectangle, Rounded Rectangle, Ellipse or CD/DVD shape. Specify the color and background settings of Greeting Card including Solid Color, Gradient, Image and Style settings. Software provides message templates which can be added during Greeting Card designing process. Option to select image from library during Greeting Card designing process. Fold designed Greeting Card with specific type of fold including Quarter Fold, Half Fold as required. Provide WordArt text-styling feature while designing Greeting Card. Data Set Series feature allows to generate the multiple copies of Greeting Card with different text value. 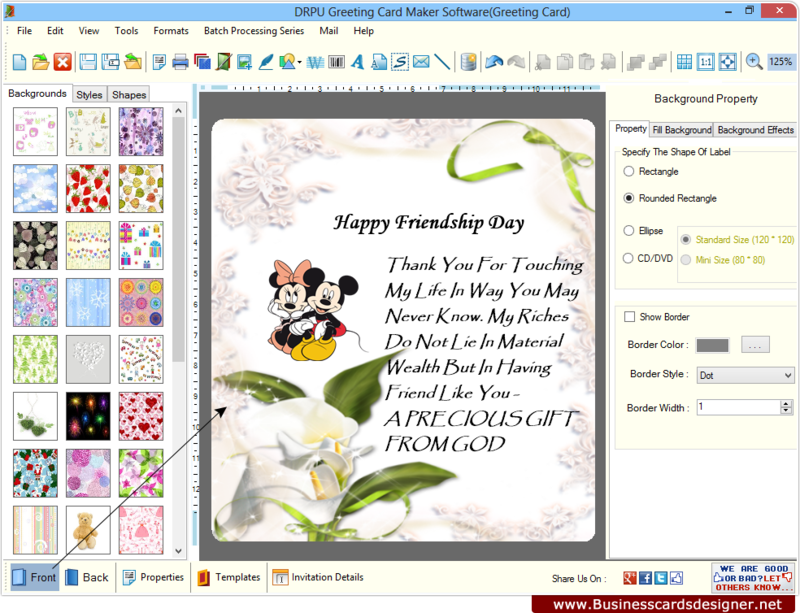 Provide option to print created Greeting Card using advance print settings.